A Picture is worth… well it’s worth something! Increasing heating system efficiency in individual homes and rental properties has the capability to reduce energy use across the state by up to 4.5%. 40% of energy in the US is used by individuals. Of that 40%, 56.6% is in home. Although the US average energy use for heating is <20% of households energy spending, in Minnesota this percentage is closer to 50%. 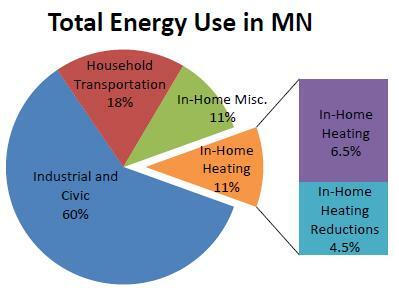 Thus 11.3% (0.4 x 0.566 x 0 .5) of the total energy used in the state of Minnesota is used to heat private residences. Fortunately, heating improvements have large potential energy savings. Heating improvements can provide up to a 20% decrease in household energy use, providing up to a 4.5% (0.4 x 0.566 x 0.2) reduction in total energy use for Minnesota. The peer review of my paper told me that most people couldn’t follow my mathematical explanation. It finally occurred to me that I should have included a graph instead. Below is the graph that I created. Now, when I tell you that the state could save up to 4.5% on in home heating reductions you can understand why! A picture can be a very effective communication device for mathematics. Just thought that was fascinating example of how a change in perspective can really fix a communication problem. The original paragraph was almost completely replaced by the graph. I don’t know if I saved a thousand words with my picture, but the picture is definitely worth something! This entry was posted in Communicating Math, EcoMathematics. Bookmark the permalink. 1 Response to A Picture is worth… well it’s worth something!